One of my favorite "listens" of the past several months is this quirky solo guitar CD by Eric Hofbauer. "American Fear" (Creative Nation Music) is a fascinating blend of recognizable tunes (from Van Halen's "Hot for Teacher" to Tears for Fear's "Everybody Wants to Rule the World") to very short original works that have splintered rhythms and fractured melodies. Hofbauer re-imagines Andrew Hill's "Black Fire" and one sees the song in a much different light. He does the same for Nirvana's "Smells Like Teen Spirit", with an abstract on the piece that seem to focus on how the song moves. One hears traces of Derek Bailey and Fred Frith in the "freer" sections and Jim Hall in Hofbauer's electric guitar sound. The take of Charlie Parker's "Moose the Mooche" features the guitar modified by threading a business card through the strings, creating a kalimba-like sound. This is quite the recital and one must come to the music with an open mind. For more information, go to www.cnmpro.com. 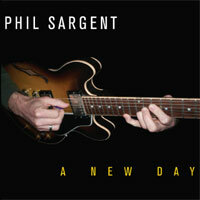 Guitarist Phil Sargent has created a program with his self-released "A New Day" that has traces of Chick Corea's Return to Forever (both the acoustic and electric versions) as well as a taste of the sound of British "prog-rockers" Hatfield & The North. Perhaps it's the wordless vocals of Aubrey Johnson, the expansive and supportive rhythm section of Greg Loughman (bass) and Mike Connors (drums) or Sargent's well-developed melodies. 6-string aficionados will appreciate the different guitar tones Sargent uses, from the reggae-inspired "clicking" background on "Kelita" to the Allan Holdsworth-like "shredding" on "Powerplay." Loughman and Connors are 2/3rds of the John Funkhouser Trio (the pianist plays on the title track), they understand poly-rhythms, and know when to really push the proceedings or lay back to let Sargent lead the way. Johnson often shadows the guitar lines, helping to fill out the sound. She leads the way on "Light", displaying a lovely sound and big range - the piece moves in unexpected directions. "A New Day" is a very pleasing blend of jazz, rock and pop influences that sounds mighty nice pouring out of the speakers. For more information, go to www.philsargentmusic.com. 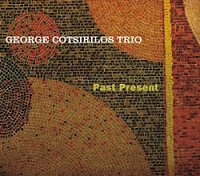 Based in the San Francisco Bay area, guitarist George Cotsirilos has just issued his 3rd CD for the OA2 Label. "Past Present" features his working trio of Robb Fisher (bass) and Ron Marabuto (drums) and is a light-hearted, softly swinging mainstream affair. Cotsirilos has a warm, articulate, guitar style with solos that rise easily out of the melodies. Despite the presence of several "standards", this is not "supper club" jazz. The Trio takes "The Way You Look Tonight" and swing it fairly hard. Fisher's bass lines are quite active, serving as a good counterpoint to the leader's rippling phrases. Marabuto's cymbal work is pleasing throughout, no more so than on the bluesy, up-tempo, "Rosie's Tune." Cotsirilos switches to acoustic guitar for an unaccompanied version of "What Kind of Fool Am I" - he really caresses the melody yet adds just the right amount of flourishes to keep the piece moving. While there's nothing "new" on "Past Present", the music is played so well, so thoughtfully and so melodically by this Trio, it's easy and rewarding to return to time and again. One imagines that their "live" shows sound just like this. For more information, go to www.oa2records.com. One is used to Bill McHenry working in small ensembles, creating musical worlds that often swing or sway with an emphasis on melodic and harmonic development. Ben Monder has created many different sonic worlds for groups large and small. On this date, the duo has experimented in developing an audio program that is adventurous in scope and execution but may be too chilly for those expecting musical fire. Yet, this CD is well worth exploriing. For more information, click on http://sunnysiderecords.com/release_detail.php?releaseID=493.